In Sydney Pollack's critically acclaimed suspense-thriller, Robert Redford stars as CIA Agent Joe Turner. Code name: Condor. When his entire office is massacred, Turner goes on the run from his enemies ... and his so-called allies. After reporting the murders to his superiors, the organization wants to bring Condor in - but somebody is trying to take him out. In his frantic hunt for answers, and in a desperate run for his life, Turner abducts photographer Kathy Hale (Faye Dunaway), eventually seducing her into helping him. Every twist leads Condor to the end of his nerves ... and will take you to the edge of your seat. With nowhere to turn and no one to trust, Turner realizes his most dangerous enemy may be closer than he ever feared. And as he zeroes in on the truth, he discovers there are some secrets people would kill to keep. Can I be the only one who constantly mixes up 1975’s 3 Days of the Condor and 1973’s Day of the Jackal? I hope not, and some confusion does make sense. Both films are political thrillers from the mid-Seventies, both use animal names, and both employ the word “day” in their titles. For most of the last three decades, I suspect I found it easy to confuse the two because I’d never seen either one. I finally took in Jackal about a year ago, so this Blu-ray release of Condor felt like the right opportunity to see it and hopefully clear up the infernal confusion once and for all. Here we meet a CIA analyst named Joe Turner, codenamed “Condor” (Robert Redford). Not trained as a field agent, he gets thrust into an active capacity when someone stages a hit on his office. This kills everyone except for Turner, as he was out at lunch during the operation. Understandably upset, Turner contacts his superiors but finds it hard to know who to trust. At first he just seems a bit paranoid, but when his suspicions prove accurate, Turner goes on the lam. In need of a place to hide and collect himself, Turner kidnaps Katherine Hale (Faye Dunaway), a shopper at a ski store. She comes along for the ride as Turner attempts to stay alive and get to the bottom of the scenario. Look up “post-Watergate anti-government cynicism” and you’ll find a link to Condor. Virtually everything about the film reminds us of the era in which it was created. I think there was some law that Dunaway had to appear in every mid-Seventies movie of this sort, and Dave Grusin’s light jazz score feels chained to the period. So don’t expect a timeless experience from Condor. Not that I regard this as a bad thing, though. 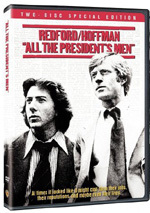 Heck, All the President’s Men is as stuck in its era as any film ever made, but it remains a taut, involving drama. Condor shows glimmers of tension but meanders a bit too much for my liking. Earlier I mentioned the way that Condor and Day of the Jackal intersect in my mind, and that continued as I watched Condor. In truth, aside from the superficial similarities I mentioned at the start, the two movies aren’t a whole lot alike. Jackal follows attempts to stop a political assassination, while Condor shows a man on the run after killings occur. The two differ quite a lot in terms of tone as well. Jackal was no-nonsense and taut, while Condor tends to become more sentimental, and it rambles. In particular, much of the subplot with Kathy doesn’t go much of anywhere. I get the feeling the filmmakers included that side of things to throw a bone to the women in the audience. Oh, the movie does find a way to integrate her into the main plot, but I think it does so in a half-hearted manner that doesn’t really fly. I do like the fact that Condor doesn’t spoon-feed us. I hate to throw out “back in the good old days” thoughts, but I think it’s true that older movies tended to trust the audience more. Today we’re beaten over the head with plot points to make sure no one gets even slightly confused. Condor doesn’t worry about that. What motivates the killings and the pursuit of Turner? We don’t get much information about this until well into the film’s second half, and even then, the flick dollops out the details in a careful manner. I think this works, as it keeps us more absorbed. We play detective along with Turner, so the story’s twists and turns are more successful. Somewhat, at least. Condor has its moments and keeps us reasonably interested for its two hours, but it feels a little slow and long. If it excised some extraneous bits and focused more on story points, it’d become more dynamic. 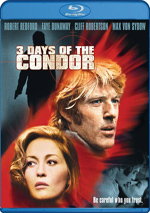 3 Days of the Condor appears in an aspect ratio of approximately 2.35:1 on this Blu-ray Disc. While much of Condor looked quite good, the flick occasionally showed signs of age. Interiors and low-light exteriors usually demonstrated the least attractive visuals. Mid-Seventies film stocks tended to be somewhat drab, and these situations made those limitations the clearest. Shadows could be a bit flat and dense, and sharpness tended to be moderately lackluster on these occasions. The film’s softest shots always came from either dim sequences or interiors. However, when Condor looked good, it looked great. Many better-lit shots showed excellent definition and clarity. Colors also stood out pretty well in those scenes. Make no mistake: Condor wasn’t a movie that went with a vivid palette. As one might expect from a cynical thriller, the flick usually preferred low-key tones. The hues remained quite attractive within those parameters, though. Blacks were dark and tight, and the film usually lacked source flaws. I noticed a few small specks, but the majority of the movie came without problems. The moderate Seventies drabness and softness made this a “B” image, but some parts of it looked like they were shot yesterday. Except for the smattering of print defects, I expect that it replicated the source material pretty faithfully. I couldn’t say the same for the film’s audio. Instead of its theatrical monaural soundtrack, the Blu-ray featured a Dolby Digital TrueHD 5.1 remix. Though this clearly altered matters somewhat, it didn’t go bonkers. The soundscape remained fairly low-key most of the time. Street sequences provided decent ambience, and a few louder scenes opened things up in a more dynamic manner. Heck, a helicopter shot even provided split surround material, as the chopper moved from the right rear to the front. That kind of information didn’t pop up frequently, though, as the track often stayed connected to its monaural roots. The score benefited the most from the presentation, as it showed nice stereo delineation. Again, general environmental material was also reasonably positive, as street sequences used the front channels well. Audio quality endured nicely after 34 years. Speech was consistently crisp and natural; no edginess occurred and the lines remained well rendered. The score was also clear and warm, with nice delineation of the music. Effects were the weakest link, as they suffered the most from the dated nature of the recording; those elements occasionally showed a smidgen of distortion. However, they were perfectly fine given their vintage. Though nothing here stood out as terrific, the track deserved an age-adjusted “B”. Expect virtually nothing in terms of supplements. We get the film’s theatrical trailer and that’s it. Boo! As a thriller, 3 Days of the Condor occasionally works. I like the basic story, and think it generally succeeds, but some slow parts make it drag at times. The Blu-ray boasts pretty good picture and audio, but it skimps on extras. The disc is worth a rental, but I don’t think you get enough to warrant a purchase given the Blu-ray’s relatively high list price.